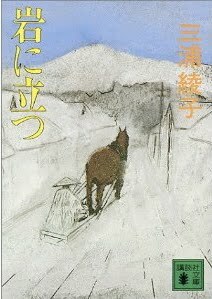 Based on the real life story of the remarkable man who built the author’s house, this novel is unusual among Miura’s works for several reasons. It is told in the “voice” of the carpenter, capturing the full flavor of an early Showa-era working-class man of limited education and rich in life experiences. The book begins with Suzumoto Shinkichi’s earliest memories of growing up in wretched poverty. His father dies an accidental death before he is born, and his mother works herself ragged to feed her children and the lazy, incompetent man she eventually gets remarried to. The book does not have a tight plot that holds the reader in suspense, like a typical Miura novel. Rather, each chapter follows Shinkichi through a stage of his life, a childhood cut short by the need for another wage earner, his early training as a carpenter, marriage, being drafted to serve in Japan’s war with China, and finally his return from the war and his struggle to regain his life and living. In spite of some dark themes such as poverty, suffering, and doubts about war, the novel is liberally peppered with humorous incidents, another factor that makes this novel stand out among Miura’s works. The book is not yet available in English translation.